Amanda Murphy is one of the newest designers at Robert Kaufman. Her debut collection Ambrosia is shipping to stores now. The fabric features idyllic florals and gentle foliage in two graceful colorstories. The Spring colorstory presents a soft palette of subtle lavenders and sky blues while the Summer colorstory offers a brighter, bolder palette of playful pinks and garden greens. 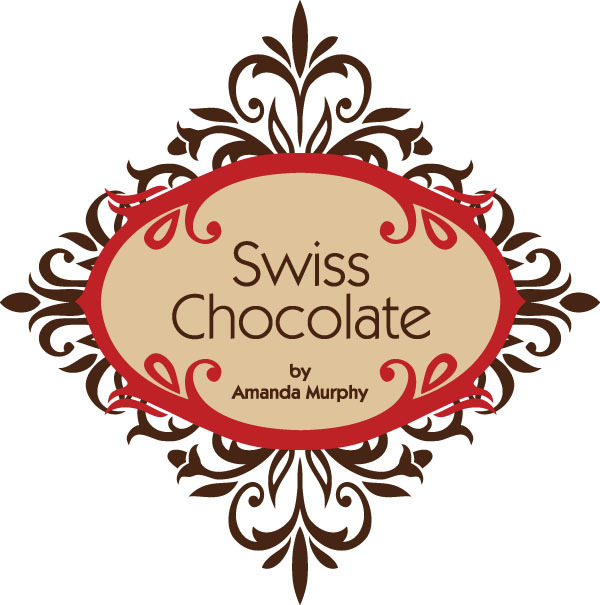 Her second line Swiss Chocolate will be shown to shops next week at Quilt Market! 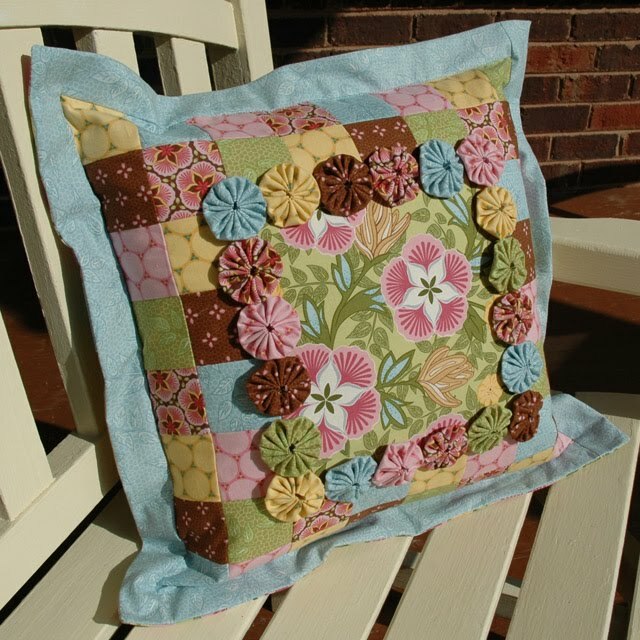 Amanda has a great blog with lots of free patterns & tutorials. Read on to learn more about Amanda and how you can win some of her new fabric! I am a fabric and quilt designer located in Charlotte, North Carolina, and I design quilting fabric for Robert Kaufman. I LOVE fabric. I graduated from Carnegie Mellon University with a degree in Design and worked as a graphic designer for a small firm in Alexandria, Virginia, and then as an Art Director for a multimedia firm in New York. A self taught sewer (I made my mom a dress fashioned entirely of pink lace when I was about 10 – and she actually wore it! ), I discovered quilting after we moved to North Carolina and started a family. I combined the techniques that I learned from many generous teachers with the sketches that I had been doing over the years... and that was the beginning of my company. I also do some corporate design work on the side. Also, we homeschool our two kids, who are 9 and 11. I feel very lucky to have a job that I love so much that also affords me a flexible schedule. It is crazy here sometimes and we are always all in each other’s space, but it works. I think our kids assume all people must sew and be surrounded by fabrics. They didn’t eat spaghetti when they were little because they were convinced I was trying to feed them thread. Have I mentioned that I LOVE FABRIC? I love to sew, quilt, go to quilt shows, do needlework, go to art exhibits. I love being around other people who like to do the same. I love all different types of fabric – from traditional to modern. I love all different color combinations. Quilting is fun because it affords you the opportunity to play with colors that you might not if you were doing a larger project. 3. How did you get started sewing/quilting? I’ve always enjoyed making things. I fashioned Barbie “hoop skirts” out of fabric and floral wire, and I used to use refrigerator boxes that my dad brought home from work to make Barbie houses. My mom really enjoyed needlepoint and had made me outfits and Halloween costumes, so she taught me the basics. When she mom went back to work when I was 11, I had to time to fill in the summers. I think that I made a tree skirt that first summer… it was very 70s. And then there was that pink lace dress. 4. 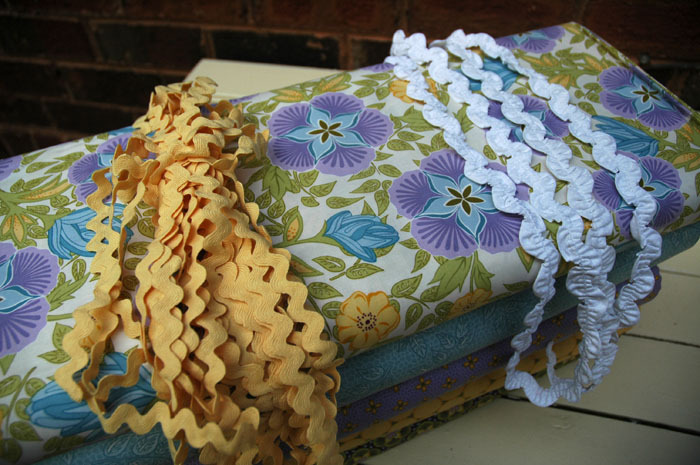 What do you like best about quilting? I love the feel of the fabric. I think that there is something really enticing about the tactile nature of sewing in a digital age. Also, I love the surprises that result when fabrics are combined in different ways. It isn’t always what you’d expect – a lot of times it is better. Incidentally, this is something I also enjoy about fabric design. I love to combine the hand-drawings that I do on the computer and play with layering and color to get unexpected results. 5. What is the hardest thing about quilting? Unstitching. Frogging. Taking out a seam to improve the finished project when you really want to jump ahead and see what is going to happen next. In a word… patience. 6. How much time do you sew or quilt during an average week? Right now I am getting Swiss Chocolate patterns ready for magazines, so I am sewing at least 40 hours a week – mostly in the afternoons and evenings and on weekends. When I am in the design phase of a fabric collection, however, I tend to get engrossed in that and only sew a couple of hours a week. I enjoy switching from sewing, to drawing and illustration work – I think it helps me in the creative process. 7. Do you name your projects or label them? Yes, but sometimes only after they are finished. I am enjoying naming the Swiss Chocolate quilts, as they are all named after desserts! 8. What other crafts do you indulge in or hope to learn? I draw and do needlework, although I haven’t done a lot of it lately because I haven’t had time. I am particularly drawn to 16th and 17thcentury band samplers. 9. What is your favorite step in the design process? Taking my hand-drawn artwork, scanning it into the computer, and manipulating it to produce unexpected results. I also love working with color. Nature, architecture, and the decorative arts. I really think that the decorative arts are under-appreciated. I recently went on a trip to Winterthur (the Dupont museum in Delaware) and was blown away by seeing the fruits of so many talented decorative artists in one place. Are you ready for a giveaway?? How about an Ambrosia Ten square! It features 11 Prints and 9 Solids. Amanda also developed three ways that you can use the Ten Square to create an entire quilt top. You have till midnight EST on Monday the 25th to enter!